Evergreen groundcover for sun to shade, Height 6" - 12"
HABIT: Dense, low growing groundcover that will climb but not readily. Small oval leaves, no flowers. A variegated form and a dwarf called ‘Elegans’ now exist. Also called Japanese Star Jasmine and Asiatic Jasmine. Native to Japan and Korea. If any of your Asian Jasmine has flowers, it’s the wrong plant – either Confederate or Yellow Star Jasmine. CULTURE: Needs moist, well-drained, well-prepared soil for establishment. Once established, fairly drought tolerant. Cut down by mowing at highest setting in late winter - again in July if wanted. Zones 7 - 11. 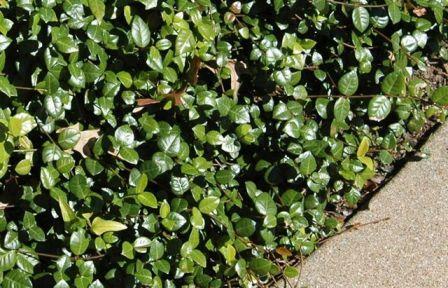 USES: Groundcover for large areas. PROBLEMS: Extreme winters can severely damage or kill this plant. Average winters will often burn the foliage brown, but recovers in spring.